In the last few months, my husband has started leaving surprises in the bathroom for me and the kids to find. It has been a lot of fun finding these in the morning. I'm talking about messages! What did you think I was talking about? He has been using a dry erase marker to write messages on the mirrors. It doesn't happen everyday, but it does start my morning off with a smile, which is a pretty good way to start the day. Sometimes the messages are as simple as "I love you. Have a good day. ", "Happy 1st Day of School! ", or "Good luck on your test today.". Sometimes the messages were funny, such as "Enjoy the eclipse today. Don't go blind.". During the week, Hubby gets up super early for work and I am not awake enough to really interact coherently with him. As a way to interact a little more in the mornings and to add some fun, I thought it would be nice to start playing games on the mirrors. I could play the night before and he could play in the morning. We each have our own color of marker, just to make it easier to keep track of turns. At first, we played tic tac toe, which as you might think, was not as exciting as I envisioned it to be. We then moved onto playing the dot game (click here for game rules). At first we just counted the number of lines to determine whose turn it was. However, once a box is made, the person gets another turn, which could make it confusing. We wrote our initials on the mirror in our marker color, and then placed a dot under the person whose turn it was. Note: It is really, really hard to take a picture of a mirror without getting yourself in the picture! The boys wanted in on the gaming action. Bernardo and I are playing a rousing game of hangman (click here for game rules). Since we are playing it on the mirror, I put a spot labeled "Letter Guesses". The person who is guessing writes their letter under Guesses. The person who created the puzzle then looks at the Guess. If it is correct, they fill it in the word/sentence. If it is wrong, they mark an X through the Guess and make a mark on the hangman piece. Higgins and I started off by playing tic tac toe, but have moved onto hangman as well. 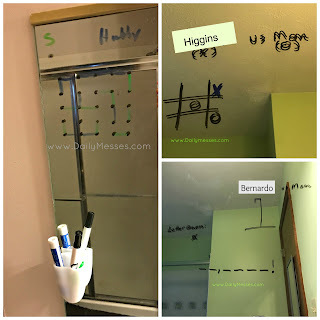 Bernardo has also created his own game of hangman on my mirror for us to play. I never imagined that it would have a such an impact on the kids. They really look forward to seeing messages or playing the games. I've gotten random hugs when they see new messages. If I forget to check to see if it my turn to play, they will nicely remind me that they took their turn. If we haven't left a message in a while, they say how much they like getting the messages (another hint to leave them more)! The boys have started leaving us messages too. They like to sneak them in before bedtime, so we are surprised when it is time for us to go to bed. Markers, Markers Everywhere: Having dry erase markers roll around the counter was slowing driving me up a wall. I found small holders from Command (I used the razor holder cup) and attached it to the mirror. I really wanted a suction cup type of holder (like this one), but couldn't find them in the stores. I guess since everyone is back to school, they're no longer in stock. Our mirrors also do not have any metal to use the magnetic cup holders. I think the Command cups should work out well though. Cleaning: I found that using an old towel or rag works well for cleaning off the marker. There are dry erase marker erasers (some markers have them on the lid or are sold separately), but I found they leave some residue or clumps behind. You can also spray a glass cleaner to get any residual marks off the glass. Higgins was a little overzealous when writing with the marker and got it on the wall next to the mirror. The eraser on top of the marker got some of it off. I tried using a wet towel, which did absolutely nothing to the remaining marker. I next pulled out the one cleaning trick that hasn't failed me yet: the magic eraser! It did get the remaining marker off, but also had a green tint when I was done, so I think it took a little bit of the paint off too. Looking at the wall, you cannot see any paint is gone, but I may try another cleaning method if it happens again. I did some research afterwards and read that rubbing white toothpaste or rubbing alcohol will clean the wall and should not take off the paint. Someone had also recommended using hairspray (also works with clothes: spray, rub gently, rinse). Wall Whoops. I made it a little harder to clean since I placed the marker cup right next to the spot. Really should have cleaned spot, THEN attached the holder. So far, this has been a fun experience and I think it is quickly becoming a new family tradition!